A thriller set in the world of Secret Service agents protecting the President, In The Line Of Fire mixes good action with plenty of character depth and cerebral touches. In Washington DC, Frank Horrigan (Clint Eastwood) is an aging Secret Service agent, still traumatized by his inability to prevent the Kennedy assassination. Frank investigates evidence at a nondescript apartment suggesting a potential assassin on the loose, and starts to receive taunting phone calls from a man calling himself Booth (John Malkovich), who openly admits to planning a kill the current President. Secret Service Director Sam Campagna (John Mahoney) places Frank back on the security detail surrounding the President, who is in the midst of a re-election campaign. Frank works with his partner Al D'Andrea (Dylan McDermott) and fellow agent Lilly Raines (Rene Russo) to keep the President safe and try to uncover Booth's true identity. But Frank's age and emotional demons get in the way and White House staff get tired of his temper and over-eager actions. Despite setbacks Frank doggedly pursues the shadowy Booth, who has a dark background of his own. 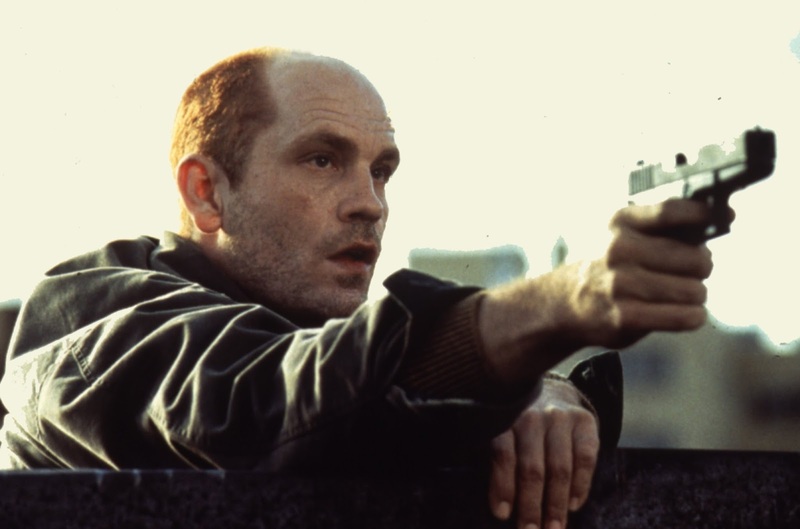 Directed by Wolfgang Petersen, In The Line Of Fire is a well-paced cat and mouse game between two damaged opponents, with bursts of action matched by thoughtful interludes designed to flesh out Frank's past and present emotional condition. 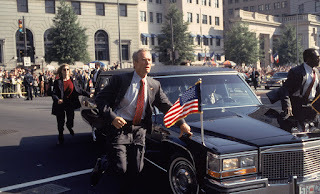 The film succeeds due to its significant investment in Frank as a flawed warrior, the last Secret Service agent from the day Kennedy was killed still on active duty. Booth pushes Frank's buttons, and the film derives as much enjoyment from their psychologically riveting phone conversations as from their kinetic on-the-ground chase scenes. The phone calls are a chess game of taunt and counter-taunt, filled with clues, traps and cryptic signposts, the killer-to-be enjoying the game only so long as it is close. And when it's time to turn up the heat Peterson knows how to deliver breathless action, with one rooftop chase landing at an excellent climax, hunter and hunted in a most ironic clutch. Once Booth's identity is revealed another layer of scar tissue is added, the boomerang of government actions coming home to roost. Although the killer is a chilling menace throughout thanks to John Malkovich's blood curdling performance and some terrific disguises, the Jeff Maguire script could have invested more time to delve into his damaged psyche. And the romance elements between Frank and Lilly are stuttering at best, the 24 year age difference between Eastwood and Russo not helping. Eastwood is much better away from any notions of love. In The Line Of Fire allows him to do what he does best: spit bullets as the angry lone wolf working within the system, fighting to save the incompetents from themselves, able to match wits with a maniac because he is unafraid to unleash his own inner fiend.